Adenosylcobalamin (also known as cobamamide or dibencozide ) is one of the two active forms of vitamin B12. 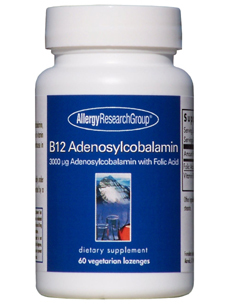 Along with adenosylcobalamin the other form of B12 actively present in the human body is methylcobalamin. Adenosylcobalamin occurs naturally in animal derived food types such as fish, meat, eggs, and milk. Vegans & vegetarians (who also avoid dairy & eggs) frequently become deficient, though the process often takes many years. People with malabsorption conditions, including those with tapeworm infestation and those with bacterial overgrowth in the intestines, often suffer from vitamin B12 deficiency. Folic acid for additional details on these 2 vitamins. DIRECTIONS: As a dietary supplement, adults place 1 lozenge daily under the tongue 30 seconds before swallowing, or as directed by a healthcare professional.